BP Chargemaster has opened a new rapid EV charging hub in Milton Keynes, claiming it to be the largest of its kind in the UK. The hub was developed by Milton Keynes Council and contractor Ringway as part of the Go Ultra Low City programme. It was funded as part of a £9 million investment package from a £40 million pot distributed to various local authorities by the Office for Low Emission Vehicles (OLEV). The site hosts eight 50kW rapid chargers that any EV can hook up to and charge from. 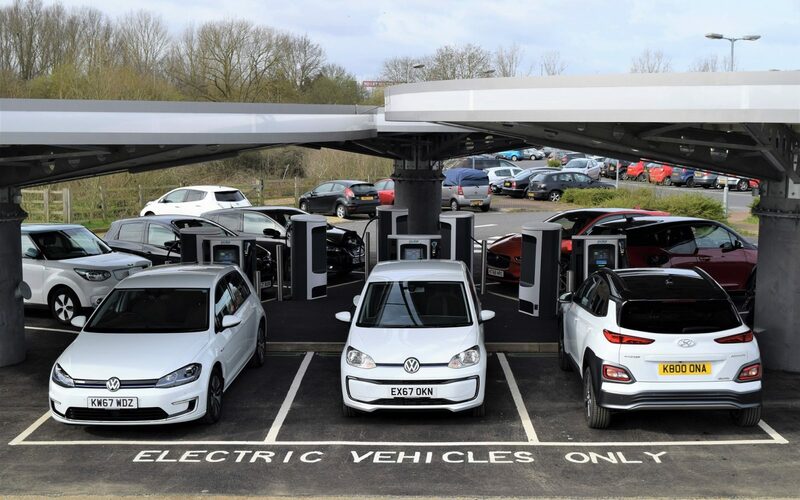 A universal charging hub gives drivers confidence that they can charge their vehicles and that the infrastructure is there, BP Chargemaster’s Tom Callow told Current±, adding that hubs of this size also help raise consumer awareness. Over 500 EVs have used the hub since it went live, with the site providing access to the facilities at the main Coachway building, including a café for drivers to pass time in while their vehicle charges. Over the course of 2019, BP Chargemaster will also be rolling out 150kW charge points at BP forecourts, which Callow says will “probably” allow for 100 miles of range in 10-15 minutes. BP Chargemaster will also be expanding more 50kW and 7kW infrastructure this year. And two more universal charging hubs in Nottingham and Lancaster are in development, featuring five and six 50kW chargers respectively. There is also the possibility of smaller hubs being developed in Milton Keynes, financed by the £9 million investment from OLEV.